As women’s history month is coming to an end, we are excited to keep the positivity flowing with three impactful women that are making the world a better place with their music. Grab your headphones and join us in recognizing great contributions made to the arts by women. From the stomping anthems of R&B goddess Deva Mahal, to Lissie’s revelation of a new personal era and transcending into the deeply emotional folk tunes of Courtney Marie Andrews, here are three amazing women-made releases, all out today! 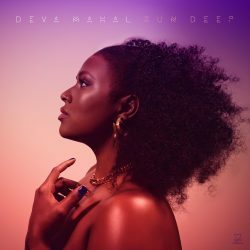 Deva Mahal, daughter of blues legend Taj Mahal releases her debut album Run Deep via Motéma Music following her much praised self-titled EP released last year. The R&B and Soul goddess’ voice floats over the pulse-pounding tracks effortlessly reflecting Mahal’s perception of building strength through vulnerability. Produced by Scott Jacoby (Jose James, Coldplay, Vampire Weekend) and Jarrett Wetherell (Beyonce/FKA Twigs), Run Deep delivers a modern sound holding rich arrangements that draw elements from blues, soul, R&B, gospel and rock genres. Recognized as one of the best performances in SXSW 2018 by the Recording Academy, Mahal mesmerizes audiences with her bigger than life performances defined by WFUV as “revelations and anthems, sung with unmatched emotion and reflecting her personal experiences.” Listen to the “It’s Down To You” below, and access full album here. Lissie, an Illinois native, moved back to her hometown Rock Island after living in California for 12 years. Along with the change, Lissie explores new possibilities in the way she writes her music, ultimately landing on her fourth studio album Castles. Presented by Lionboy Records, the album shelters country and folk induced pop tunes supported by electronic beats and synths. As it is the first time we hear electronics in Lissie’s work, she explains to The Independent how moving back to Midwest has ironically triggered her to start working and creating more digitally, primarily out of necessity because of distance. Moving to the country has made Lissie a better musician, and while you are thinking whether you should do the same, play “Best Days” in the background and get the full album here. Courtney Marie Andrews’ new album May Your Kindness Remain, strikes the listener with a graceful and highly emotional voice that is undeniably impressive. While Andrews’s previous album Honest Life marked the break in her musical career, the Arizona born singer-songwriter had been touring as a keyboardist, backup singer and bartending whenever she was not creating music. Andrews sings and plays guitar on every song and has co-produced the album with Mark Howard (Bob Dylan, Tom Waits). Released via Fat Possum Records, the whole album touches upon the isolating feeling of loneliness, whether expressed through her own relationships or through people she has never met. Get a glimpse with “May Your Kindness Remain” below and get lost in Andrews dynamic vocals here.